The temperature has dropped from the seventies into the high fifties. Brrr, The wind forecast to Mallorca are not ideal. High winds force 7/8 and then the weekend less wind but right on the nose, SW. So, I maybe here a while longer waiting for a a better direction. I still have plenty chores. Dennis soldered my broken radio connection wire but I am not getting the SailMail going yet. Next I will try get the AIS to work with the new Multiplexer that is supposed to come in today via UPS. Marc came over for dinner last night. I’ll miss his photographic talents once we’ll part here. 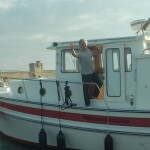 Marc, the Quebecois on “Vlimeux” joined me here, yesterday, in Port Camargue. He took a bunch of pictures of me on the Rhone when we left there a week ago, today. It is s rare opportunity to have someone to take good pictures of me underway. I am sitting in mosquito ally in the park at the chamber of commerce. I just picked a supply of Boletus mushrooms, I hope Marc is brave enough to have them for dinner tonight. It has cooled off some but still very pleasant. The French N.W. coast was battered by very high winds yesterday and a good part of the area is still without power today. I hope to receive my multiplexer tomorrow. I still have to bend the mainsail on the boom and a few other minor items and I figure I’ll leave on Thursday of Friday morning for Ibiza. 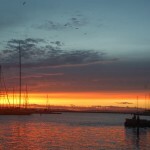 It is €75 moorage here for 5 days or a week, from last Friday. We set the clock back to standard time, last night. I rode my bicycle from Port Camargue to Grau de Roi, to go to mass. I had a flat and had to push the bicycle the last km and now I have a long walk back from here, in Grau du Roi. When I stood at the closed gate of the St.Pierre church there was Viviane on day trip from Nimes with her brother Jean Pierre. 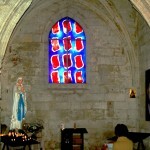 On the mass schedule we learned that there would be a mass in Aigues Mortes at 11 a.m. They drove me. This church St.Louis is from the 13th century. it is named after Louis the Ninth, who was one of the first Crusaders, and was later raised to sainthood. His 800 the birthday will be celebrated here on April 25, next year. It is a gorgeous church with unusual modern stained glass windows. 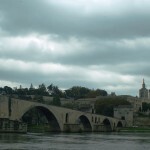 Just like last Sunday in Avignon the small church was at least 75% full and the average age was about 25 years below of what I have become used to in Holland and the old churches in Italy and when I was in Reims. As a tourist I do not get into the suburban churches in the countries outside of Holland but I have the impression that the French Catholic church is more alive and real also among the young. Viviane converted to Catholicism at 60, Jean-Pierre is protestant. He treated us to a superb buffet lunch to the west, direction Sète. On the way back the hard top went down, it is just like a California summer here. I have been working hard on getting the mast retuned. The mast exit halyard turning blocs and the Schaefer blocks on my running back stays were totally frozen and it took soaking in diesel fuel and lots of silicone spray to get them rolling again. 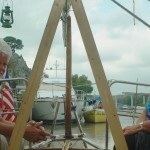 I still have to install the boom and put the main sail back on. I should be done by Wednesday. Dennis and Griet, a young couple from Leuven/Louvain who now live on their power boat near here and work here, I met in Aigues Mortes, last Tuesday night, are hauled out where I am. Dennis has offered to help me with soldering the broken radio connection. 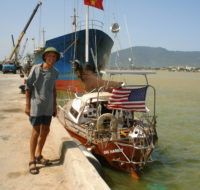 So, I expect to have my SailMail working in the next days and will notify you then for using that address from now on. Now I still need to get the AIS to work. The sailing conditions have been excellent for getting form here to Ibiza. Hope it will hold. 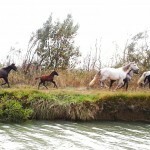 I include two pictures of the wild horses I took last Tuesday with my Samsung Tablet. 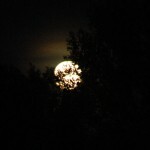 As you can see I am still having problems with my zoom lens. There is no doctor in this house and I am still groping in the dark what causes my chest pains. But they are slowly easing up. I think it may just be gas from my chronic digestion problems. I survived a good portion of Boletus/Eekhoorntjesbrood/Porcini I gathered under the Pins Maritimes, near the marina. I had a bag full in no time. I dropped some of it with my new Belgian friends. Viviane at the chapel of Ste.Therese, this is for my Portmouth, Va. parish friends. Friday October 25. A sailboat again. The mast was raised an hour ago. Friday October 25, 2013. This blog is a longer than the previous ones. I have written most of this on the boat where I have power to keep the battery charged, now I’m back on th park bench to send this. The drawback of trying to find just any free WiFi connection is that there are lots of them who will use their free service to plant crap on your system. My laptop has slowed down to a crawl, my keyboard would not respond, my internal mouse stopped working. I just ran SpyBot and they found a string of toolbars and a total of 29 problems. There are still a lot of deprived sick people trying to make someone else’s life miserable. Yesterday I washed the boat down from the filth of the 241 locks. There had been a heavy dew and a perfect occasion to get this done. Then I discovered the damage done from one of the attacks on the boat by, presumably, the Gypsy kids. But I suspect that the one late at night was from an air gun. It missed the forward starboard window by four inches and made a pretty deep hole. I’m in my favorite uniform, shorts and no socks. I’ve kissed my first palm tree. Port Camargue is a manmade community, dug out of the salt flats, a huge marina with a couple thousand boats, 95% sail….Condominium homes and docks. The residential section reminds me of the Alameda middle class sections built since the seventies. Marc is from Quebec City. He will turn 56 this week. At 24 years old he sold his first I.T. company and went sailing for six years, Caribbean and Bahamas. 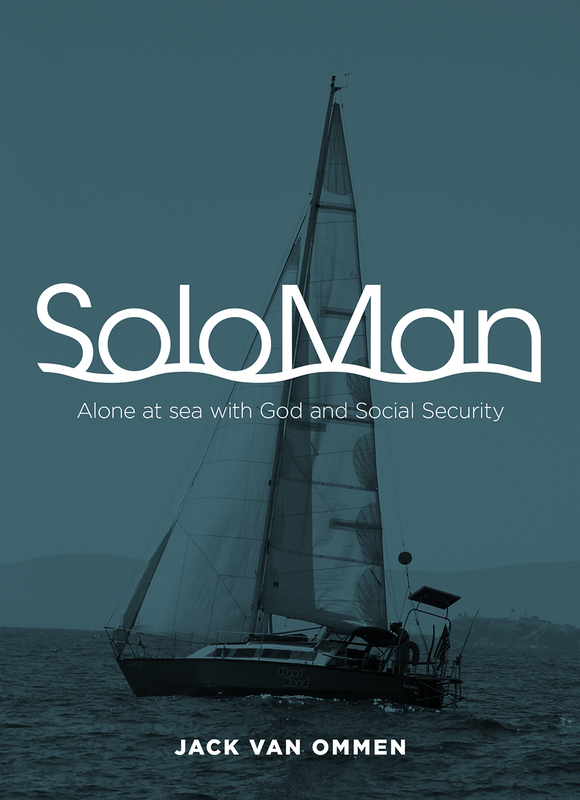 Then he repeated this with two more ventures, cruised the Atlantic Coast and the Chesapeake Bay, bought a larger sailboat and found his Nordic Tug 37 a year ago in England. It was the boatshow model with which Nordic Tug had planned to enter the European market. The Nordic Tugs are built in the state of Washington. “Vlimeux” the name of his boat is a Quebec word for Rascal. Marc also picked out the motor cycle for me to cruise the Latin American West Coast and to come up to Tacoma in the spring of 2014, a Kawasaki KLR 650. (Let’s see if Sid Nesbit is reading this blog….) Marc has motor biked through Central America, as well. 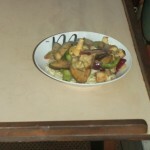 He cooked a superb stew in Aigues Mortes last Tuesday evening. 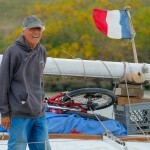 He will be another Quebecois friend I would visit if I can realize my plans to sail the St. Lawrence in 2016? This way of seeing the world by sea and by inland waterways is growing on me. I’d like to come down from the Great Lakes to the Gulf of Mexico after I have come up the Atlantic coast again in 2015/2016. Recapitulation of the trip from Amsterdam to the Mediterranean: I left Amsterdam on September 24 and arrived here on October 23rd. Twenty nine days, about 1600 KM or roughly 1000 land miles. 241 locks, €145 in moorage fees, 180 liters (45 gallons) in Diesel fuel. 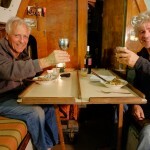 I doubt if there is any other single handed sailor who passed through 600 odd locks in Europe alone, and over 6000 km of European inland waterways. I was lucky with the weather. Unseasonably warm. I am also pleased to have had another opportunity to experience France for nearly a month. One of my favorite countries. I listen to the radio frequently and get a pulse on the current issues. Just like in Holland many of the radio programs are D-jayed by a trio of two young men and one lady. They try to outdo each other in dominating the conversation, which is done at the speed of lightning and after all is said and done you have not learned anything from it. I think this all originated in the USA by FOX television. But France also has some very worthwhile radio programs like France Culture and a couple religious stations like Radio Catholique France (RCF) which besides religious programs also has excellent news coverage, popular and classic music, cultural and current events and a French language service from Radio Vatican. On October 4, in Reims, I listened to an interview on France Culture of Peter Knapp, Swiss-French photographer, painter and as it turned out great philosopher. Close to 80 years now he was the fashion photographer for “Elle”, a well known ladies magazine. For anyone with an elementary knowledge of the French language I would recommend that you search for this interview on France Culture Radio. He represents the total opposite of the “trio” d-jays I described. Beautiful, crystal clear use of the French language and his every word is a lesson. Right now the French are not very happy with us, the scandal of the American secret wire-tapping of the EEC commissionaires. My plan is to leave here as soon as I have everything checked and have a good weather window and then sail to the Baleares (Mallorca, Ibiza, etc) and then probably make my next stop in Gibraltar. I will confirm this in my next blog, but if I can get the Sail Mail to work without the audio wire, or with it repaired/replaced, then you should from then on just mail me at my old SailMail address. ( I will not post the address because of easy access by spammers to this blog, and will do a “where is Jack” mail to my address list). And CC me at my cometosea address. I am being eaten alive by the mosquitoes. They are trying to find a spot I did not smear repellent on. Turns out the mast stepping is tomorrow. I am all set up for it. One disappointment the multiplexer I ordered and paid for cannot be sent to me till Monday and would then arrive Wednesday. Why did the guy not tell me that before I jumped through hoops to get an address for him and make the payment after PayPal went through the same nonsense as the bank problems I have had. I discovered a broken wire between the ICOM radio and the Pactor Modem and no-one can solder it here. So what to do? I believe it is the audio connection A long single pin goes into the SSB radio and an eight wire pin into the modem. But when I cut the 8 pin connector open it looks like it connect to just one wire and a ground shield. t would take a week to get a replacement, I figure. Wi-Fi is tough to find I am sitting now in a park to get the signal from the Tourist Office. Yesterday at McDonalds was worse no place to hook my power cord to either. So I have to work fast and keep it short then I can recharge on the boat. 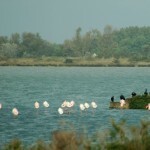 Yesterday I saw lots of Pink Flamingos in the salt marshes along the canal to the open sea. But my camera is not giving me a good clear picture any longer. I may have to look for a new and more powerful lens. I can smell the salt air of the Mediterranean. The enormous old lighthouse from the 12th century right above the harbor where I am moored for the night was once at the sea’s edge but now is about 10 km further inland. Marc Pilar, my new Quebecois friend, went together with me and a river cruise boat through the last of the large Rhone locks. 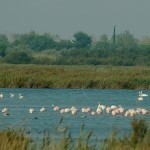 Just north of Arles we turned SW on the Petit Rhone which wanders through the Camargue, the swamp land in the Rhone delta. 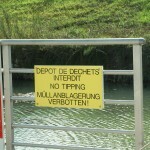 Just before making my turn I went through a very rough patch on the Rhone. The SE wind had piped up to over 35 knots and the chop had the boat on one of it’s wildest bronco rides, ever. But once I got into the calmer river it all eased up again. But the wind is still howling here. 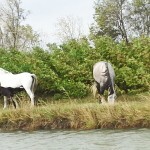 I got a few good pictures of the wild horses in the swamp, but did not see any pink Flamingos. 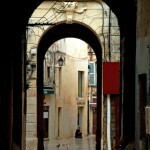 Marc helped me yesterday to correct several incorrect setting on my Nikon D-50 camera. He makes great pictures and know much more than I do about photography. He also happens to have the identical Samsung tablet and Navionics charts and was able to help me with it as well. 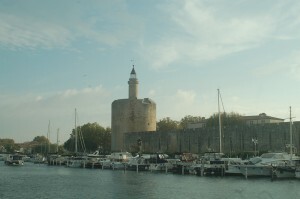 I still have not heard back from the marina in Frontignan and begin to wonder if they actually exist. Tomorrow I will have to decide where I step the mast. 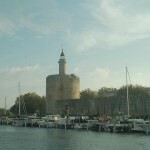 Wednesday morning: I am heading for Port de la Camargue, it looks like a good place. I have to leave here in a half hour to pass through two bridges that open at noon. So, this evening palm trees and saltwater pictures. 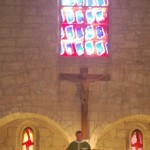 Last night I went to mass at the Chapel de St. Louis, A small old church with around a 250 seats which were 75% filled. And it was encouraging to see that the avergae age was far below what I have been getting used to in Europe. Most were young adults and even though it was an evening service there were also a number of children. The priest was a Spaniard and not always too easy to follow. A young lady with guitar led the singing which was also well participated. Took a shower, did a load of laundry and hung it on the life lines. It was a summer day. I am in just a T-shirt again. I finally managed to get Googlewebshop to accept my payment details and I downloaded the app for the Navionics charts on my new Samsung tablet. Looks like a great way to navigate. I bought a cover for it and gagged at the price about $ 75…. I am slowly growing into using more of the tablet functions. One of these days I’ll not be dragging my laptop any longer to the wi-fi locations on my route. My cousin Adri and her husband Gert came to visit me this afternoon. 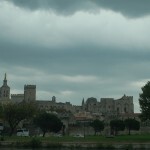 A nivce break for me to see family this far down the Rhone. They are with their RV about 40 k.m. away from here and on their way to Lyon tomorrow. 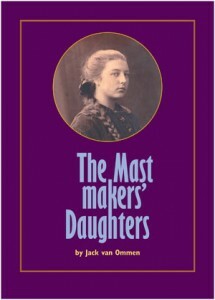 Adri is the oldest daughter of my mother’s youngest sister, Rientje, Rientje is the one who wrote the two beautiful poems in “The Mastmakers’ Daughters”. 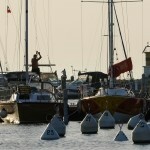 I expect to be in the marina in Frontignan by Thursday. The problem is that I cannot find a mailing address for the Amiral Nautic Club anywhere and my e-mails to them are not being answered. And I need to have a few essentials sent to me there. So, I may need to find another location to step the mast. Is there a Doctor in the House? I have a pain in the left upper part of my stomach, just under the rib cage and less pain stretches up towards my left arm pit, which feels just like I have a bruised rib. It is not very noticeable when I am standing. It is most noticeable at night laying down and I can now only lay flat on my back, for a while I could sleep on the left (yes left) side but it hurt when I tried the right side. 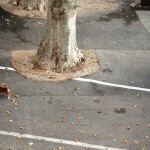 Self-checking, pressing the area does not seem to cause any discomfort. I have had some problems with my digestive tracts that I had checked the last time I visited the US. I have no insurance here. I checked the internet and dismissed kidney problems from the symptom descriptions. I do not feel sick or nauseated, just a discomfort. 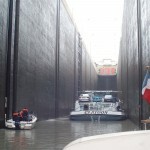 Yesterday I did 4 deep locks, the deepest was the one at Bolène, 23 meters or a little over 75 feet. I could just barely keep up with a commercial barge but this gave me the opportunity to get in right behind him and that saved me a lot of time. I left from k.m. 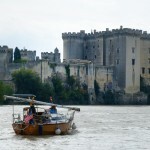 112 at about 10 a.m. (after waiting for the marina office to open at 9) and I anchored at km 201 around 6.15 p.m. Just around the corner from where the Vieux Rhône flows into the main channel. This kept me out of the heavy current and a restful night, except for the fact that the bridge for the TGV (bullet) train, but they don’t seem to run at night or I was tired enough that it did not bother my sleep. There was a strong wind from the south yesterday and again today. This makes for a very uncomfortable ride, the waves get real choppy against the strong current. And when a fast loaded barge comes up current then it really gets nasty, especially in the narrower canalized stretches. Their wake bounces back and forth from shore to shore for ever and I just hobby horse and make no progress. As you can see from the pictures, it has been dark overcast with a few spatters. But it is nice and mild, in the high sixties. 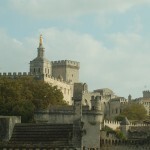 Avignon is an amazing place. I will try to go to mass here at 6.30 p.m. I am trying to connect with my cousin Adri and her husband Gert, they are camping nearby. and a strong headwind I’ll just miss it by a few hours. forbidden to leave your trash here.